The DB 601N was an improved version of the DB 601 that with it's re-designed cylinder heads, increased manifold pressure and revolutions, using 'C-2' natural or 'C-3' synthetic 100 octane fuel obtained increased power output. Originally 1400 PS output was planned. The powerplant entered production in the end of 1939 and was used in the Bf 109E-4/N, E-7/N and Bf 110C fighters and destroyer, and the He 111 P and Do 215 bombers. 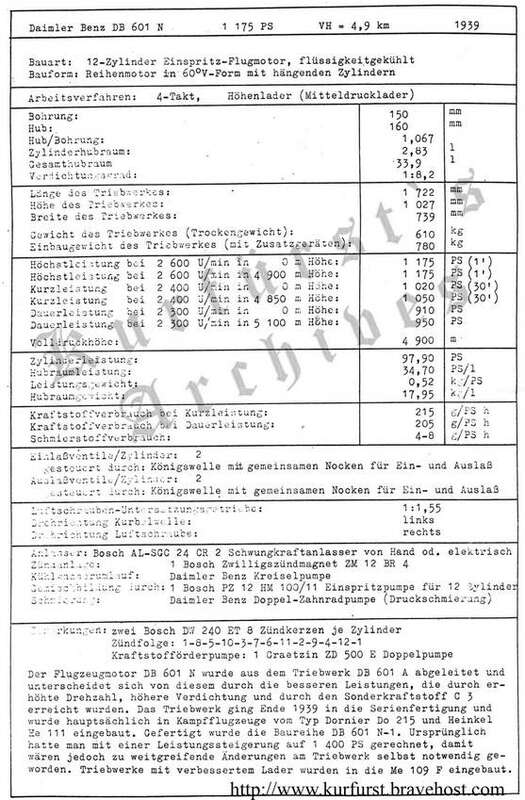 The datasheet notes that the Bf 109F use another version of the DB 601N, with improved supercharger ('verbessertem Lader'). This latter version had higher rated altitude, otherwise it was similiar. It should be noted that German datasheets are sometimes quite inconsistent about time limitations; this one qoute 1-min limitation, possibly carried over in error from the DB 601A's 1-min special power boost. Other documents of the DB 601N however give the limit as 5 minutes. The fuselage of Bf 109E-4/N, W.Nr. 1190, 'White 4', is being unloaded by Curtiss workers. The Emil belonged to 4. Staffel Staffel of JG 4, and was flown by Uffz. Horst Perez on, when it was shot down on the 30th September 1940 over East Dean during the Battle of Britain. Note the fuel triangle with the '100' label, pointo to 100 octane fuel and the DB 601N. Bf 109E-1 : 16 pcs, Bf 109E-3 : 1 pc, Bf 109E-4 : 54 pcs, Bf 109E-6 : 1 pc, Bf 109E-7 : 34 pcs, Bf 109E-8 : 2pcs. Bf 109F-1 : 5 pcs. Total 112 Bf 109E with DB 601N present in service, plus 5 Bf 109F. Bf 110C-1 : 4 pcs, Bf 110C-4 : 40 pcs, Bf 110C-5 : 12, Bf 110C-7 : 14 pcs, Bf 110D-0 : 18 pcs, Bf 110D-2 : 20 pcs, Bf 110D-3 : 8 pcs, BF 110E-1 : 176 pcs, Bf 110E-2 : 14 pcs. Total : 306 engines, ie. 153 Bf 110s with DB 601N present in service. He 111P : 8 pcs, Do 215 : 68 pcs. 2. Page 29 in Heinz Mankau/Peter Petrick : Messerschmidt Bf 110, Me 210, Me 410. Last updated 3 August 2006.